solubilized and converted to readily biodegradable substrate, as was done in using the simple model in Chapter 10. Clearly state all other assumptions. The wastewater flow rate to the activated sludge system is 12,000 m'/day. How many kg/day of waste solids are produced? Express your answer both as VSS and TSS. What fraction of the VSS is biodegradable? What is the SOUR of the waste solids? Does the estimated SOUR indicate that the solids are stabilized? 9. Using the information developed in Study Question 8, size an aerobic-digester to reduce the SOUR to 1.0 mg 0./(g VSS-hr). Assume that bsn is numerically equal to bM. Also assume that FSS are conserved. Compare the SRTs required for configurations consisting of one and two tanks in series. Size the bioreactors, calculate the oxygen requirements, and compare the power required for oxygen transfer to that required for mixing for each configuration. Assume that the digesters will be operated without solids recycle and that feed solids are thickened to 15,000 mg/L as TSS. Also assume that the efficiency of the oxygen transfer device is 1.2 kg 0:/(kW- hr). What percentage VSS destruction will each digester achieve? 10. Use ASM No. 1 to define the characteristics of the waste solids produced by an activated sludge system operating at 20°C and an SRT of 5 days. For these calculations use the wastewater characteristics presented in Table E8.4 and the stoichiometric and kinetic parameters in Table 6.3. Clearly state all assumptions. The wastewater flow rate to the activated sludge system is 12,000 m'/day. How many kg/day of waste solids are produced? Express your answer both as COD and VSS. What fraction of the waste solids is biodegradable? What is the SOUR of the waste solids? Does the estimated SOUR indicate that the solids are stabilized? 11. Use ASM No. 1 to evaluate the effect of SRT on the performance of a single CSTR CAD system receiving the waste solids characterized in Study Question 10. Model it as a continuous feed process with solids recycle. After preparing a graph of percent solids destruction versus SRT. choose an SRT to give 38% solids destruction and size the bioreactor to maintain a solids concentration of 15,000 mg/L on a VSS basis. 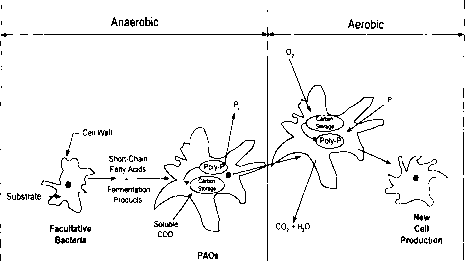 How much alkalinity would have to be supplied to maintain a residual alkalinity of 50 mg/L as CaCO,? 12. Reconsider the CAD system sized in Study Question 11. Maintaining the same SRT and total bioreactor volume, reconfigure the system as an A/AD system like that shown in Figure 12.7c. Then use ASM No. 1 to investigate the effects of the recirculation flow rate and the relative sizes of the anoxic and aerobic zones on the performance of the system. Specifically, investigate the effects of those variables on the percent solids destruction, the effluent nitrate-N concentration, the oxygen requirement, and the alkalinity required to maintain a residual alkalinity of 50 mg/L as CaCO,.